New BAD NOIDS 7" + Fried Egg Mixtape out now! Hey folks, just got back from Fried Egg tour, which was a blast! Great to see and meet some of you while I was on the road. I've been assembling BAD NOIDS 7"s nonstop over the past few days and they are up now on the site, along with a sweet batch of new distro arrivals, many of which I picked up on tour. 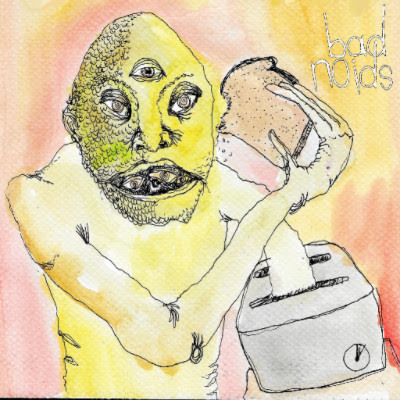 BAD NOIDS new 7" features three tracks of their signature, obnoxious brand of Cleveland punk. Easily their best recorded material in my opinion. Tony from SQRM/Gluebag/Burnt Envelope contributed the artwork which turned out incredibly well. The BAD NOIDS boys are currently touring Europe! Go see 'em if you can - tour dates are available here. The Fried Egg mixtape features 16 tracks total, almost completely unreleased and profesionally mastered/duplicated for best sound quality. Some of my favorite tracks on this are from DEFORMITY, RIK AND THE PIGS, RUBBER MATE, TOMMY T, and QUITTER. 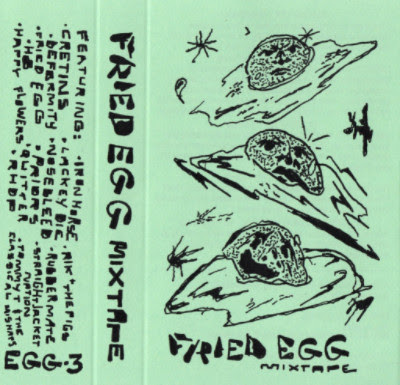 You can listen to both the BAD NOIDS 7" and Fried Egg mixtape via the Feel It webstore. Also wanted to note that CHRISTI are going on tour in November. They've hardly played outside Virginia before, so now might be your only shot to see CHRISTI if they come through your city. They will have the last copies of the "Cry" 7" on Feel It available and possibly a tape with brand new material that rules. Here are the dates, and if you think you can help with any of the starred dates, please drop me an email! More details on individual shows available via the band's Facebook page. Alright, I've got to run to play a show tonight. The only other news I've got is that KALEIDOSCOPE are set to record their "Vol. 3" LP for Feel It in December. Fingers crossed that we can at least have test presses for the band's appearance at Everything Is Not OK 3 in March.